Can Labor wedge the Coalition on #climatechange in #ausvotes2016? Action on climate change is a live issue at the 2016 election, but it is still divisive. The Australian Labor Party unveiled it's climate action plan to take to the Federal Election, likely to be on July 2. A lot of deliberative thought and nuanced politics have gone into this plan with targeted changes in different sectors. Environment and community groups, along with the Business Council of Australia, broadly said the plan was positive, although there were criticisms raised about the need for climate policy to become bipartisan to ensure stability in the economic transitions needed. Environment groups stressed that it was a useful starting point and much better than the Coalition government targets and policy, but didn't go nearly far enough to meet the obligations now enshrined in the Paris Agreement of limiting warming to well below 2 degrees and aspire to 1.5 degrees limit on warming. Here is what Malcolm Turnbull had to say in parliament on emissions trading after he was deposed as opposition leader by Tony Abbott, which highlights comments he made in a blog post in December 2009 "The Liberal Party is currently led by people whose conviction on climate change is that it is “crap” and you don’t need to do anything about it. Any policy that is announced will simply be a con, an environmental figleaf to cover a determination to do nothing. After all, as Nick Minchin observed, in his view the majority of the Party Room do not believe in human caused global warming at all." While Labor's plan is reasonably comprehensive they are also reaching out an olive branch to Turnbull for bipartisan support. Personally, I don't see this as being able to be accepted. Turnbull has been wedged by a moderate ALP climate policy and the right wing climate deniers in the Liberal and National Parties. Climate denial has become part of the neo-liberal ideology. "Labor is putting a Climate Change Action Plan before the Australian people that will get Australia back on to the path to a clean energy future; but it’s also the type of Plan that Malcolm Turnbull should embrace – forging the consensus for change we need in this country instead of kow-towing to the Abbott-right in the Liberal Party. In his heart, Mr Turnbull knows that Direct Action isn’t working, that he needs a plan for renewable energy to grow beyond 2020, and that we need to get broad-scale land clearing back under control." Mark Butler said in a speech. On climate targets Labor are sticking with a 45 per cent emissions reduction on 2005 levels by 2030, consistent with advice from the Climate Change Authority. This is double the current 26 to 28 per cent target by 2030 of the Coalition Government. But it is really the bare minimal target and still be on a 2 degree C emissions reduction pathway. Almost certainly it is too little for Australia's equitable share for 1.5C pathways. Modelling by the Federal Government's own consultant Warwick McKibbin showed that increasing the target to 45 per cent would have minimal impact on GDP growth. Labor also endorsed a target of Net Zero Pollution by 2050 consistent with the Paris Agreement to achieve a balance between emissions generated and those offset, sequestered or removed in the second half of this century. There is silence in this climate policy about increasing Australia's 2020 climate target. Prime Minister Kevin Rudd, as part of the Copenhagen Accord, committed Australia to 5 per cent emissions reduction, unconditionally, but also promised an increase to 15 per cent or 25 per cent reduction targets if certain conditions were met such as an ambitious global agreement (which we now have with the Paris Agreement). The Abbott/Turnbull Government, kept with the 5 per cent target, but the higher ranges were never dropped from our UNFCCC commitment. Both the Government and Labor have been silent on this commitment since Greg Hunt signed the Paris Agreement in New York on 22 April 2016. The Climate Change Authority argued in March 2014 that the conditions had already been met to move Australia's 2020 targets to an intermediate level putting forward 19 per cent as an equitable target for Australia. With the energy sector being a large source of our emissions and 70 per cent of our electricity derived from polluting coal, Labor has concentrated key policies in managing this energy industry transition. Our coal fired power stations are ageing and need to be replaced. Labor emphasises a 'just transition' to renewables should be planned, with closure of existing coal plants being industry funded, and workers and communities be supported in this process. Professor Andrew Blakers, Director, ANU Centre for Sustainable Energy Systems, said this 50 per cent by 2030 goal should be easy to beat. 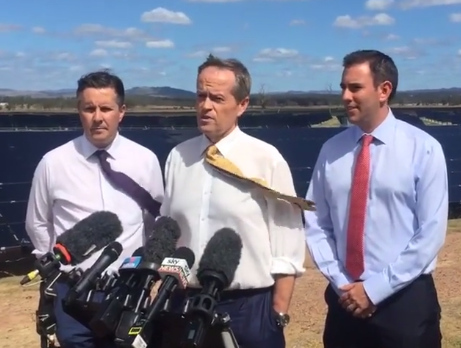 "The ALP goal of 50 per cent renewable electricity by 2030 is unambitious – current deployment rates of about one gigawatt (GW) per year each of wind and photovoltaics gets us there. Doubling the current deployment rate to two GW per year each gets us to 80 per cent renewable electricity – and a halving of total greenhouse gas emissions." Labor will also provide more certainty and flexibility to the Clean Energy Finance Corporation to operate according to it's charter. Specific funding of $206.6 million will be provided to ARENA for funding of a Concentrated Solar Thermal power station. Port Augusta was considered for a state of the art solar thermal power station with storage to replace coal, with a fully costed proposal, but to date has not received enough Government support for the project to go ahead. With a decarbonisation target of 2050 Labor have also proposed a "Just Transition" plan in the phase-out of coal fired power. It has established eight framework principles for this just transition. Point 3 advocates a market based approach to industry restructure as proposed in an ANU Working paper by Frank Jotzo and Salim Mazouz whereby costs associated with closure of a generator are born equally by other fossil fuel generators (See this explained at The Conversation). Just for the electricity sector Labor is proposing an electricity emissions trading scheme to place a cap on carbon pollution. This will be based on a model proposed by the Australian Energy Market Commission (AEMC) for electricity generators. This scheme provides for a fully internal market in carbon. According to the AEMC the ETS will operate "without a significant effect on absolute price levels faced by consumers". The ETS design is very similar to one that Malcolm Turnbull and Nick Xenophon championed in 2009, according to Lenore Taylor writing in the Guardian: Labor's electricity ETS 'exactly' same as designed for Turnbull, economist says. Associate Professor Frank Jotzo, Director, Centre for Climate Economics & Policy argued that Labor's emissions trading scheme for electricity is very similar to what the government may bring in anyway. "It is not economically optimal, rather it is fashioned to deal with the difficult politics of the issue. The emissions trading scheme for the broader economy seems geared to help meet the strong national emissions targets through industry-funded purchases of international permits. Before 2020 however the emissions trading scheme would be ineffective and heavy industry would have little incentive for action." Jotzo said. Dr Paul Burke, Fellow, ANU Crawford School of Public Policy, highlighted the problem with offsets, "Labor has signalled that their approach would have a quite heavy reliance on emissions offsets, both international and local. There is a good reason why offsets are cheap: they can be of low quality. It would be preferable to move to a system with a more limited role for offsets." he said. Labor wants to reinvigorate National Vegetation management Framework and adopt consistent reporting of tree clearing across all states. "Labor will ensure that State land clearing laws are consistent with Australia’s international obligations and commitments." declares their plan. Labor will try to pass legislation, possibly an amendment to the Environment Protection and Biodiversity Conservation Act (EPBC) as a climate trigger related to broad-scale land clearing. "This will ensure proper and rigorous investigation of broad-scale land clearing impact on Australia’s ability to meet its agreed climate change commitment to keeping global warming well below 2 degrees Celsius." The Nationals will run a scare campaign against this feature that it is an 'imposition of red tape', and that it 'denies farmers their freedom to manage their land'. But the reality is farmers face a greater impost from coal and CSG mining companies taking over farming land and affecting regional groundwater supplies. The WWF called for the 5 year reviews to focus on increasing pollution targets, and accelerating the renewable energy transition. "This will put Australia in a stronger position to protect the people and places we love, and build a sustainable prosperous future." Ms Caught said. Australian Conservation Foundation CEO, Kelly O’Shanassy welcomed Labor’s target for zero net emissions by 2050, but urged a stronger 2030 target. "But even Labor’s interim target is a significant leap forward from the Turnbull government’s plan to cut pollution by 26–28 per cent by 2030, which leaves Australia with one of the weakest targets among developed nations." Protecting the Great Barrier Reef from further damage was a prominent concern, "All parties will need to go further if we’re going to protect Australian communities from worse droughts and bushfires and give the Great Barrier Reef a genuine chance." said Ms O’Shanassy. There was also disappointment that new coal mines hadn't been ruled out in the climate plan, "If one particular proposed coal mine – Adani’s massive Carmichael project – proceeds, it will create billions of tonnes of pollution, contributing massively to climate change. Cutting pollution from coal-fired power stations and coal mines, and supporting clean energy, should be key issues for all parties at this federal election,” she said. Oxfam Australia Chief Executive Dr Helen Szoke highlighted the hope of limiting warming to 1.5C and what Australia should be doing, but was disappointed the plan did not rule out new coal mines. "The reality is that 90 per cent of Australia’s coal reserves would need to be left unburned to secure even a 50 per cent chance of keeping warming below 2 C." she said. “To have a hope of limiting the global average temperature rise to 1.5C – a limit rightly demanded by the world’s most vulnerable countries – a country like Australia needs to be reducing its carbon pollution by at least 65-80% by 2030 and reaching zero emissions well before mid-century." said Szoke. “The Opposition’s differentiated approach to key sectors of the Australian economy is welcome and the Business Council would work with a Labor government to maintain the competitiveness of the Australian economy." said Westacott. Doctors for the Environment issued a statement that also lamented Labor’s lack of mention of new coalmines citing the impact of coal on climate change and health. The statement outlines that pollution from coal burning causes cardiovascular, respiratory and neurological diseases, as well as lung cancers and contributes to the reduced life expectancy of residents in coal-producing areas. It also targeted the increasing emissions from unconventional gas developments and Labor's silence in this area of the climate plan. Professor Mark Howden, Director, ANU Climate Change Institute, identified that an adaptation role was missing from the climate plan. "Climate adaptation is another string to the innovation bow and it will bring major economic, social and environmental advantages if done well. To acknowledge the need for climate adaptation does not undermine the positive options in Labor’s Plan for reducing emissions. It is simply a practical and pragmatic response to the realities of change as it unfolds." he said. Miriam Lyons, climate and energy policy expert with GetUp!, drew attention to the ideological attacks from the government causing renewables investment to tank, jobs lost and opportunities go overseas. "The Turnbull government now needs to step up with its own credible, pro-renewable plan if it wants to prove that it has moved away from Tony Abbott’s attempts to destroy the one of the biggest growth industries of the century." she said. “Poll after poll shows Australians want more renewables and a managed transition away from coal-burning power." Ms Lyons said, "We want the jobs, the reduced pollution and the cleaner, more affordable power. Communities adjacent to coal mining and burning are sick of the air pollution that causes respiratory illness. 100 per cent renewable power by 2030 is achievable and comes with billions a year in fuel-cost savings, as demonstrated in the Homegrown Power Plan we released jointly last week". As expected, the Government and individual Coalition candidates are reacting to Labor's nuanced climate plan with a scare campaign. Their attack focuses on labelling the climate plan as a new 'carbon tax' that will 'increase electricity costs astronomically', with a scare campaign for farmers on not being allowed to cut down trees. This is despite the fact that Labor's plan explicitly does not include a carbon tax or a fixed price on pollution. Greg Hunt should know the difference between an Emissions Trading Scheme and a carbon tax. His 1990 university thesis was on 'A tax to make the polluter pay'. Yet now he conflates an ETS with a carbon tax. Lenore Taylor at The Guardian argues Why Coalition climate scare campaign is not credible and makes no sense. Read more from Michael Koziol at the Sydney Morning Herald how Malcolm Turnbull reprises elements of Tony Abbott's scare campaign to fight Labor plan. An example of scare tactics is the statement by Marty Corboy, Nationals candidate in the Victorian seat of Indi. He categorised Labor's climate plan as "another new Labor tax on hardworking Australians". "Their plan to bring back an ETS and increase the target to 45% will increase power prices by 78% by 2030, according to modelling by the Climate Change Authority..." he stated. Corboy conflates the inclusion of broad-scale land clearing activities and it's affect on Australia's emissions in Labor's climate plan, as an attack on farmers freedom to cut down trees. "Their plan to restrict land clearing and overrule state government tree clearing policies will mean that not only will we have state vegetation police, but in future a new form of federal vegetation police as well." Corboy says. But Labor's policy isn't directed against individual and small scale tree management, but at landscape scale deforrestation and bush clearing. Activities at a scale that impact Australia's emissions such as in Queensland. Please no more old metaphors, Mr Corboy, of drowning in 'red tape'. If farmers are doing broad-scale land clearing without proper assessment of such changes on emissions, erosion impact and biodiversity loss, they are out of step with modern farming and land management practices, not to mention global sensibilities and practices with climate change. It is clear that most farmers work hard in preserving the wealth of the soil and land to pass on to future generations. A climate trigger against broad-scale land clearing isn't directed against small-acre farmers caring for the land and needing to cut down a tree or two on occasion, but agribusiness that are keen to pillage the land for short term profits at longer term expense to the land, environment and climate. Don't you 'love' the politically biased headlines in Murdoch's media empire? So. Will Labor's climate policy be a plus or minus for voters? Will the Coalition scare campaign work second time round?